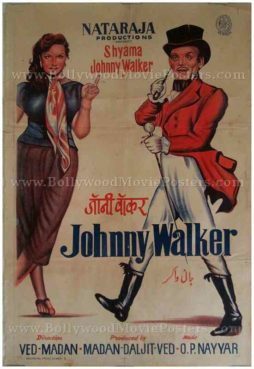 Extremely rare hand painted Bollywood poster of the classic Hindi comedy, Johnny Walker (1957) for sale. This is an actual surviving old Bollywood poster of the 1957 Bollywood comedy that featured brothers Johnny and Tony Walker. Printed and circulated during the first first release of the film (somewhere in the late 1950s), this Hindi comedy movie poster was originally designed for publicity of the film but never ended up being used. This Indian comedy movie poster features stunning full length portraits of Johnny Walker and Shyama. Walker is seen wearing a monocle in this funny Hindi movie poster.